This might be your best work!!! Amazing!!! Your always amazing artistry has become astounding. Congratulations! And I need to say "WOW!" myself in response to the overwhelming compliments I have received since last nite from several previous customers and hopefully some future ones - thanks to you all so very much !! I am just about finished with the webpage which shows the rest of the completed painted photos and a few production shots as well. I'll try and get that page uploaded in the next few hours. Thanks again to all !! Benjamin Haines wrote: How much would one of those Anguirus kits cost and how much would it cost to get you to do your thing with it, KaijuZoo? I'd love to create one for you Ben but I could only get 3 kits and they all sold out very quickly ($210). 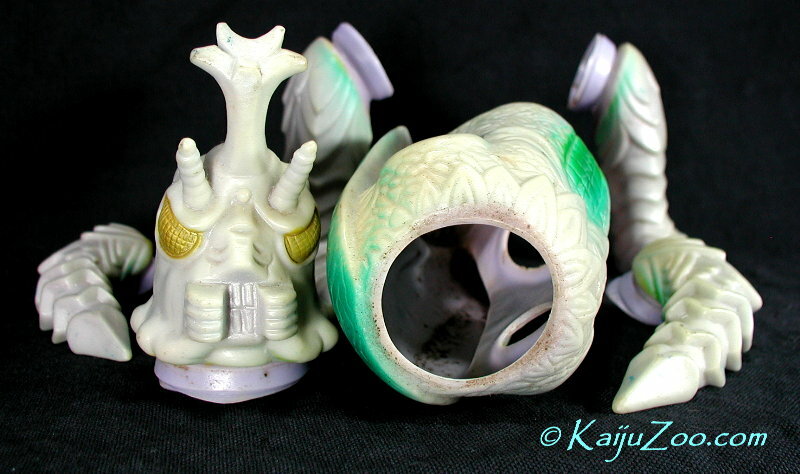 Most of my KaijuZoo exclusive series were limited to 10 each and a few were limited to 5. 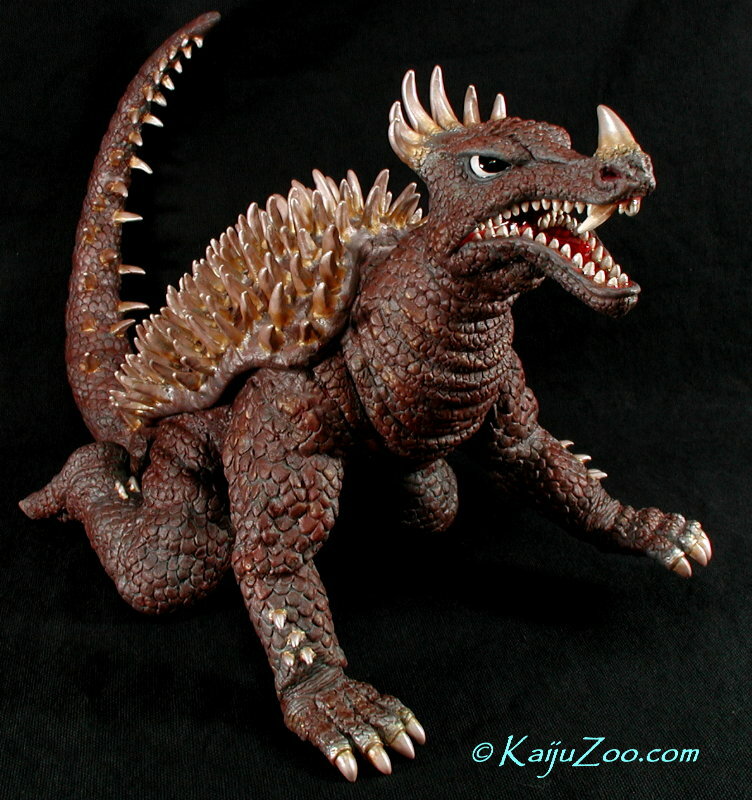 The Anguirus project is my seventh completed series and is the only one made of just 3 available figures. But if you are interested in something else, please let me know. Sorry for not posting this earlier, but that Anguirus looks great! Nice work, John! And God bless you for making it through 3 sets of spines, one set was enough for me. It really shows the detailed coloring in both the body and the horns/spines. This is some of your best work yet - truly amazing! It was a lot of fun working with the bright metallic colors of the amazing Trendmasters design and even more fun to see my idea for the "surgery" have such a nice result. For more than one reason, this is truly the only figure like it in the world !!! I really love how you closed the gap in the spines. It was kinda hard for me to tell at first without anything here to reference, but it really looks great! I really don't know what I wanna do with this guy! If I take him home and put him in the collection, he'll really brighten it up, but then I won't get to see him! So I think he's gonna stay here for a while. He really stands out in my mini collection of duplicates here at the apartment, lol! Really great stuff, man! Thanks again! Excellent work Kaijuzoo and a true prize for your collection Hesei!!!! Hesei wrote: Soooooo pretty. I really love how you closed the gap in the spines. It was kinda hard for me to tell at first without anything here to reference, but it really looks great! By the way, here is some more surgery that I had to perform. While painting the mouth, I noticed that one of the teeth on the right side upper jaw was missing due to a clogged mold while being formed (another SG has the tooth showing). So I painted in the tooth but it was obviously funky being 2-dimensional. So I left it unpainted. But you can see from the signature card (which had already been completed) that it was just too obvious not being there. So after taking all the pictures, I looked at it again and decided that I needed to perform some "dental surgery". I cut a tiny, tiny piece of vinyl to the right shape, glued it in place and then repainted it. I just was not satisfied with the tooth being missing so I had to do something about it - such "attention to detail" is part of why my reputation as an artist continues to grow !! Got my Angilas today. It's gorgeous!! They are now coming off the production line: one is sold, one pending and this one is making its public debut at G-FEST this weekend in Chicago. If you are at the convention, stop by my booth in Artist's Alley and check it out!! 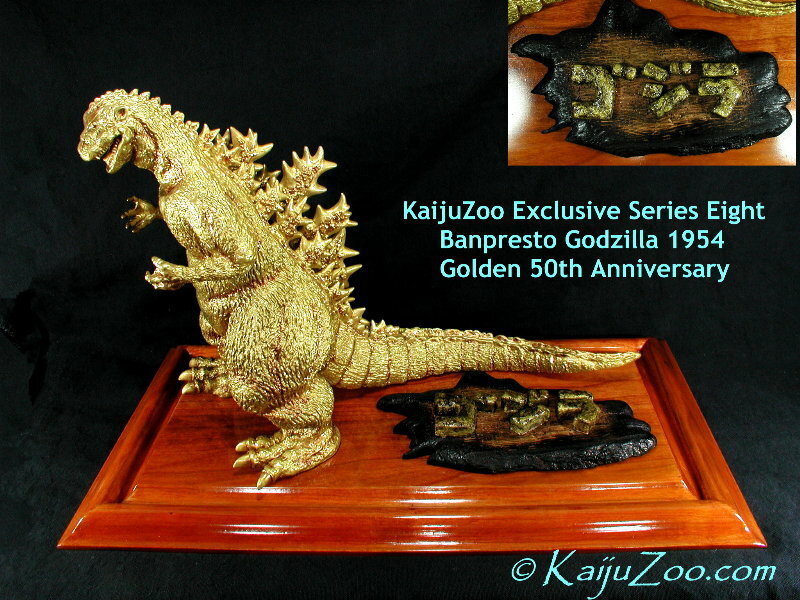 This is a very limited KaijuZoo exclusive series of only 5 in the world. The figure has all joints glued and detailed as well as repositioning of the tail and resculpting of the back fins for a more dynamic pose. 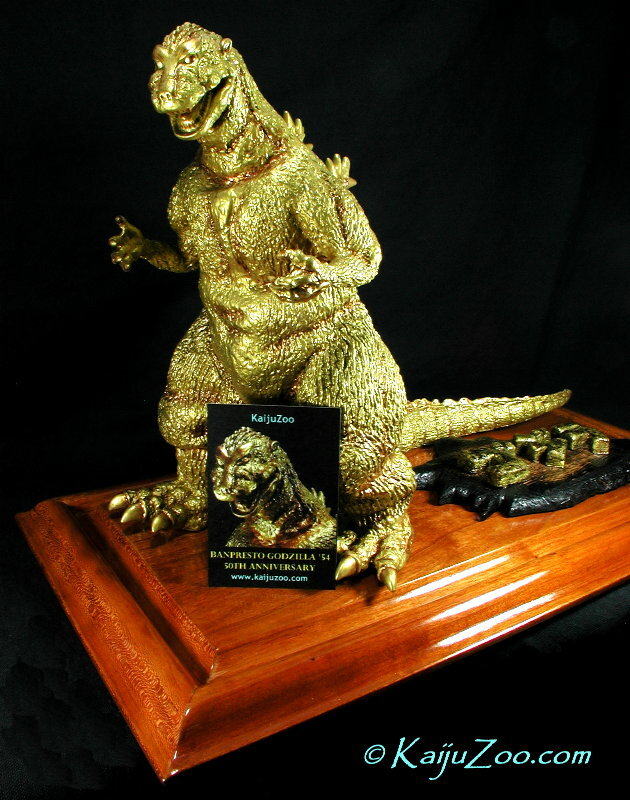 The base is constructed by me and made from exquisite solid cherry wood and it is complemented with the hand-made GOJIRA plaque. Overall, it is a nice blend of retro-ruggedness and elegance befitting the golden 50th anniversary of the King of the Monsters. Pre-order reservations are now being accepted (1 sold; one sale pending)- Price = $265.00 (includes $50 for the figure and base wood/supplies and more than 15 hours labor). Please let me know ASAP if you would like to reserve one of the three available. that is just...WOW! How i wish i could go to G-fest this weekend to just see that in person cause i am sure photos do not do this statue justice. Very well done. Congrats on such an impressive exclusive. I really like the name plate you hand made. It fits very well. gojira138 wrote: that is just...WOW! How i wish i could go to G-fest this weekend to just see that in person cause i am sure photos do not do this statue justice. Very well done. Congrats on such an impressive exclusive. I really like the name plate you hand made. It fits very well. Hey many thanks for the props, you have given me some very kind compliments !! 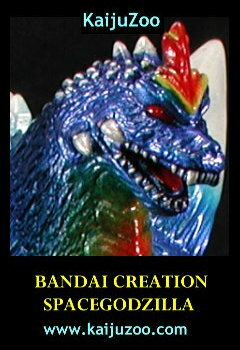 I also meant to point out that the 11" Banpresto Godzilla '54 (Shodai-Goji) was sculpted by the famous Yuji Sakai and was released in 2002. 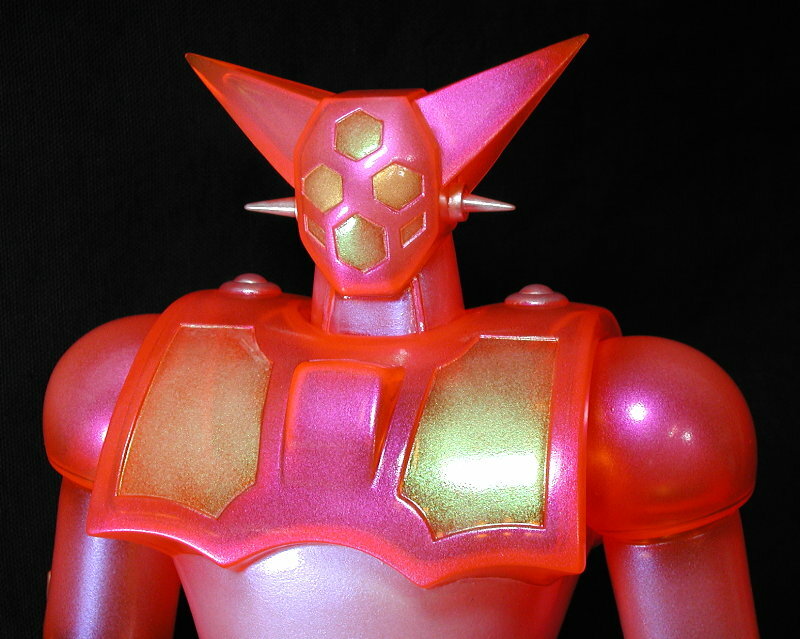 Additionally, this past January, the Banpresto was voted First Place on the Monter Zero poll for picking the best representation of the essence of the G'54 Shodai sculpt. 1. the tail was modified to give it a natural curve and lift to create a more dynamic pose on the wood base, much better than just being a "tail dragger". 2. I also removed with "surgery" all of the excessive vinyl at the bottom of the outer fins. The figure now looks like it did in the movie, very much improved. I will have to take a "before and after" shot to show you how much a difference my "attention to detail" made. 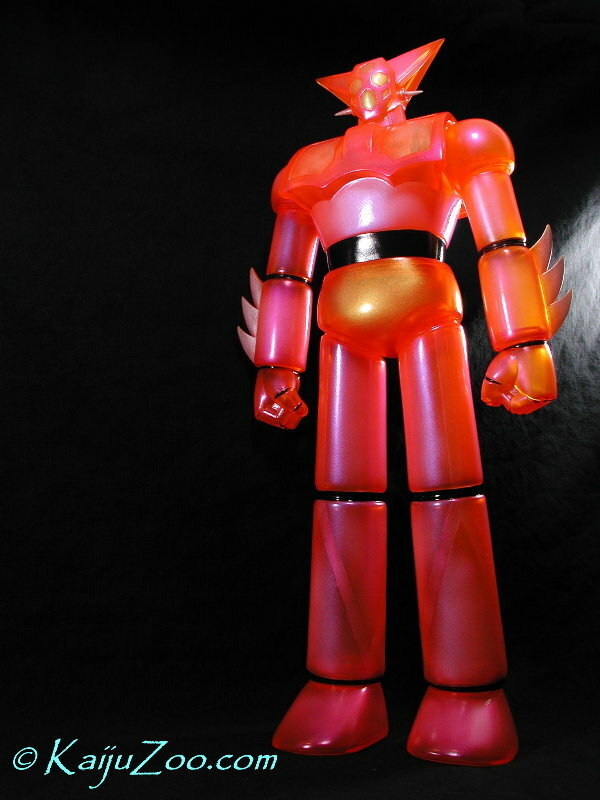 gojira138 wrote: From the New Toy Purchases thread = ma ma mia! as if those first photos were not enought! Now I am feeling spoiled! I cant wait to see the updated photos. That Gezora is just remarkable the way you have customized it. Great job once again. 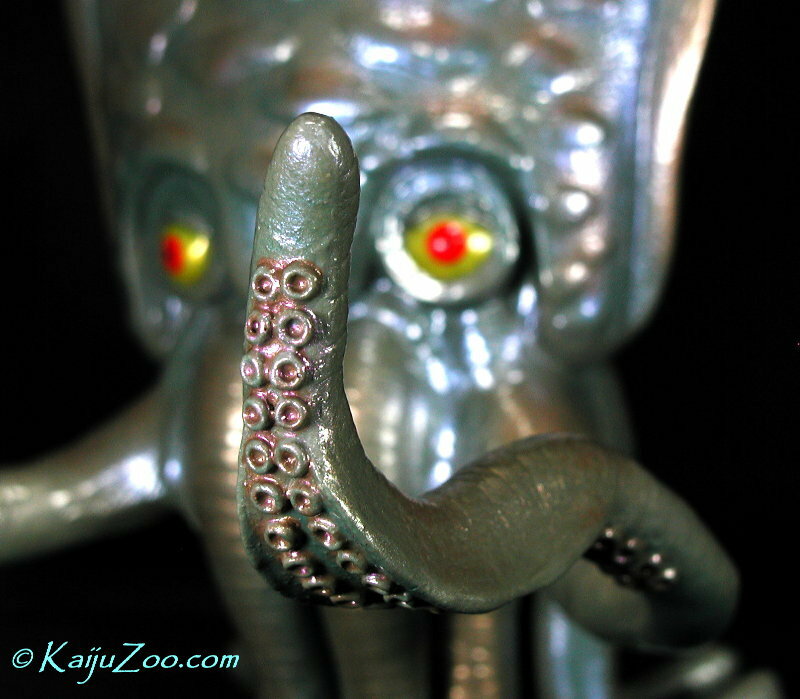 also check out the just completed KaijuZoo Exclusive Marmit Gezora webpage. 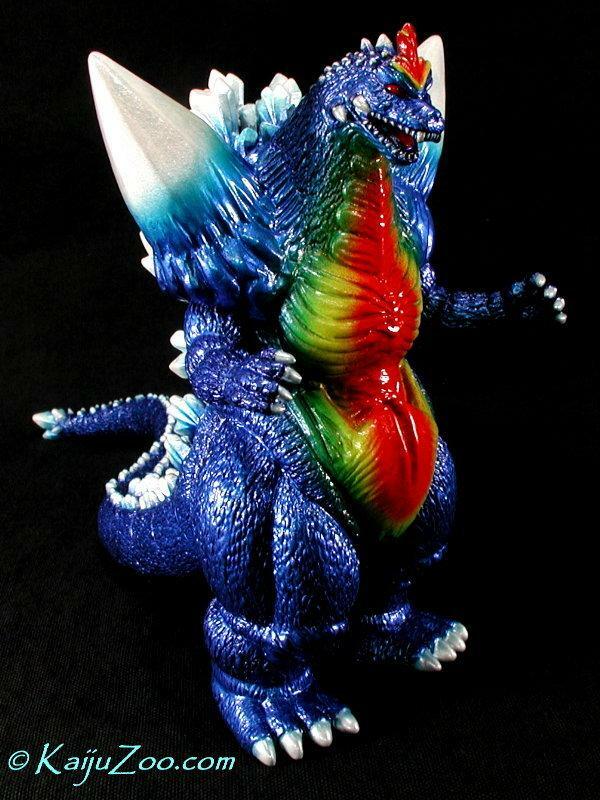 This is the ninth KaijuZoo exclusive series, this time consisting of only five built and joint-detailed Marmit Gezora's painted in a stylized realistic manner. They are painted with metallic colors and oversprayed with color-shift paints to give the figures the glossy and iridescent look of a marine aquatic animal. Please notice in the photos how the blue, gold and pinkish radiant hues seem to move around, the effect is even more amazing when viewed in person under natural light!! Two of the Gezora's are already sold and one more sale is pending. 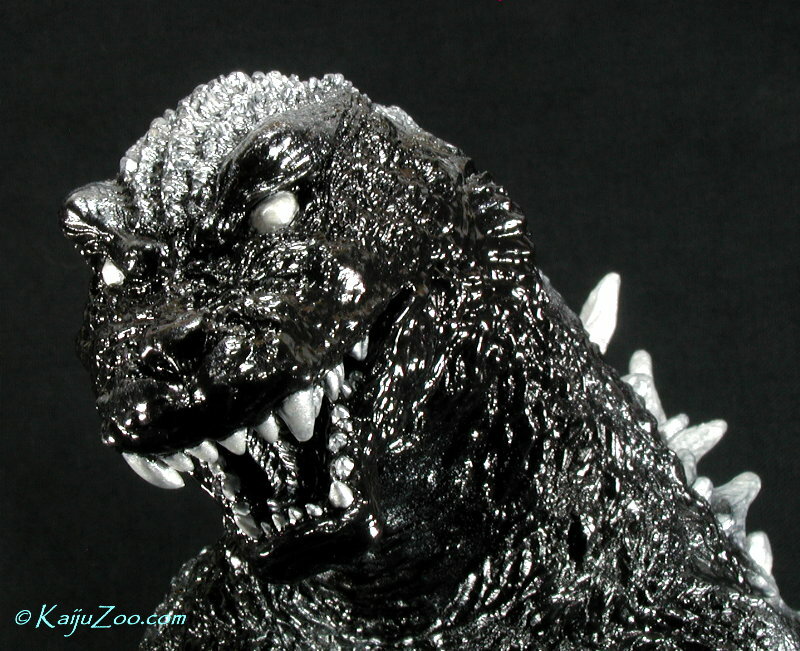 So please let me know asap if anyone would like to place a reservation before they are SOLD OUT like happened with the KaijuZoo Anguirus kits. Thanks!! Unveiled at the recent G-fest in Chicago, here is perhaps my most interesting and unique project to date - the restoration of a very rare 35-year old original Bullmark Hawaii Megalon. 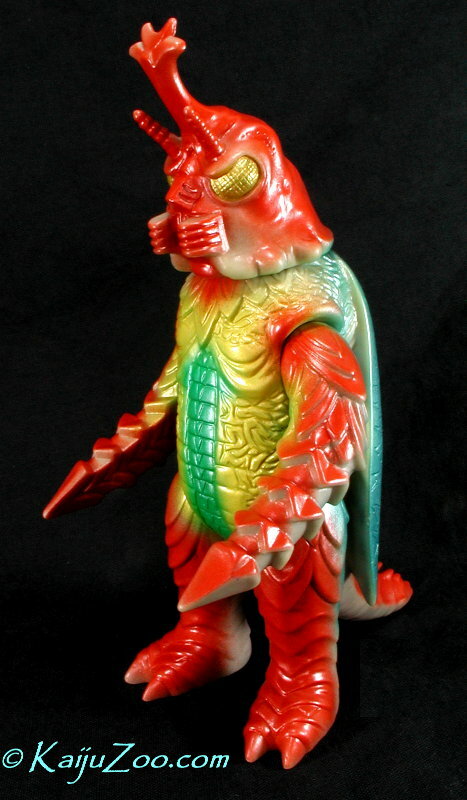 Keep in mind that kaiju toys (such as those made by Marusan and Bullmark in the 60's and 70's) were just that - TOYS - items for kids to play with out in the backyard or take into the bathtub. This pic is fun because when I disassembled the Megalon for cleaning prior to painting, you could actually see the dirty residue of dried water and mud that had accumulated within the figure more than three decades earlier. Another interesting detail about this photo is the comparison of the oxidized and bleached outer vinyl with the almost perfect interior vinyl which shows the very original color. Also of note is the relative fragility of the original Bullmark red/brown paint compared to the gold and green - I have seen the same thing on other early examples of this figure. So please check out the complete page for more details and many other pics! Here's another commission I recently completed: the evil and sinister monochrome GMK Godzilla using the huge West Kenji vinyl kit. I just finished editing the rest of the pics for this project and building the webpage so I'd be pleased if you take a look! 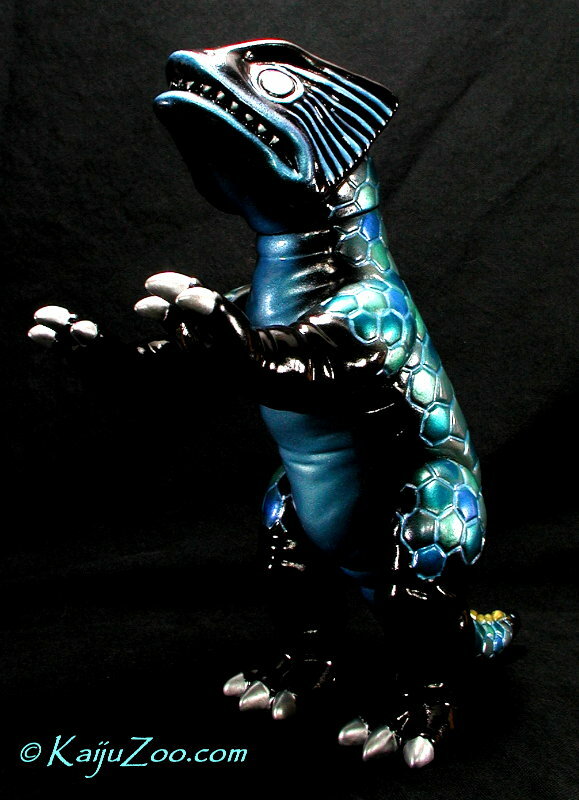 Thought you might want to take a look at my latest KaijuZoo commission which is also being discussed over at ToyBoxDX. 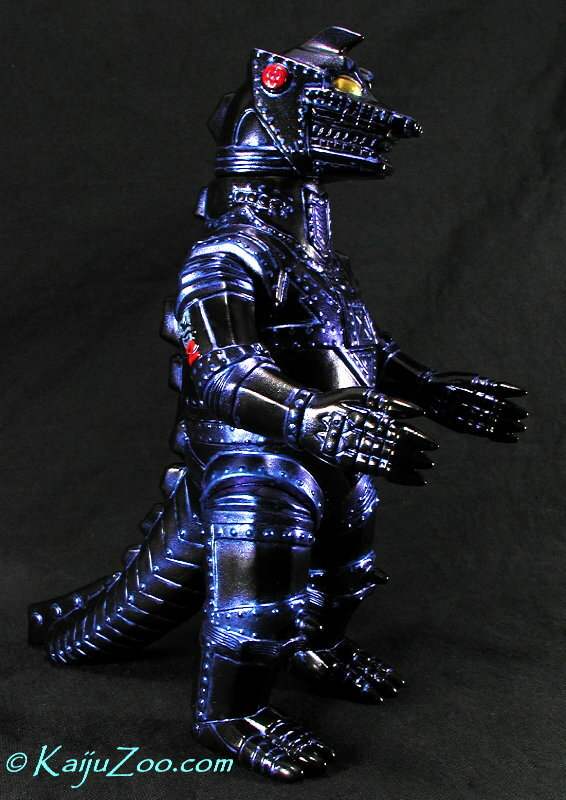 My design challenge with this M1Go Lucky Bag Black MechaGodzilla commission was how to use paint to make the figure more interesting yet still allow the evil blackness of the vinyl sculpt to "pop". With airbrush and by hand, I applied to every rivet and mechanical joint a single coat of a thin translucent metallic blue and then a single coat of my blue color-shift translucent. That made the "blueness" come alive with shades of purple here and there as the figure is rotated. Quite an amazing site to behold in person, much better than the pics!! 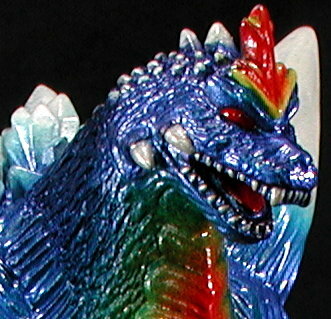 I hope to get a commission for the companion M1 Black Titanosaurus to provide it with a similar color-shifting effect, perhaps using reds on the black instead of blues. The more I use these color-shift paints, the more impressed I am with their wildly cool results. But please let me know what YOU think!! This commission is based on the M1Go Ultra Kaiju Peter which was released earlier this year as an unpainted YELLOW Lucky Bag figure. The marvelous concept painting provided by my client is shown in the slideshow so be sure and check that out. We are both *ecstatic* in how this project evolved from concept to completion and it is arguably my *best work* to date ! More pics will be available later this week when I get the webpage completed. Just completed the webpage with some nice new pics of this project. Only three of five left - $265. Please email if interested, thx.